Well, I'm sure you have guessed that 4th wasn't my goal for the World Championships in Canada. I had a lot of momentum behind me with two world cups wins and the world cup overall, a win at MSA last year and a huge group of supporters that traveled from New Brunswick, Ontario and BC to cheer me on. The crowds were insane. It was the loudest race i've ever done. 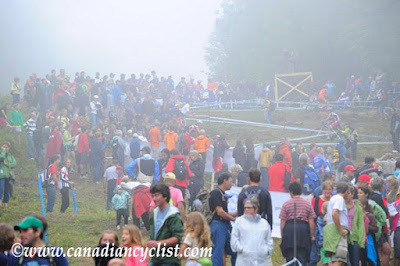 Kids with NB flags ran alongside me screaming, the switchback climbs were lined with roaring fans and the descents exploded in noise as you came through. My preparation was good. I felt strong and ready. My head was good. I didn't feel overwhelming pressure, just confident. 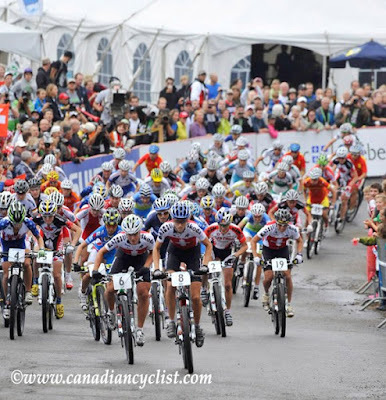 The race started with my best ever World cup start and some good line choices saw me move into 3rd for the start loop. Eva Lechner, Maja and i got off the front, but into the woods on lap one i wasn't able to enter first and the chasers caught back up to us. On leaving the first woods Eva slipped and I got out front. everything was looking good. I was out front with about 10 seconds, but on the 2nd half of the lap I had some costly slips and lost my advantage on Maja. We entered 2nd lap together, but again i couldn't grab first position into the woods, lost focus and lost contact with her. I felt strong, but Willow caught up to me. This time I was determined to grab first wheel into the woods. I did, but barely. Willow and I rode together the next lap before she pulled away from me. I don't even remember the details, just the suffering and the amazing noise of the crowds. The best part of the race by far was the last 10 minutes. I don't know if there has ever been a tighter battle for the final positions. Irina had bridged up to me and I was having flashbacks of the Olympics. But going into the climbs we could see Willow. In the woods she was off her bike and then again in the rock garden. The two slips put us into the rock garden at the same time. Willow rode the alternate line while I rode the rocks and Irina ran them behind me. Willow and I entered the base at the same time and the crowds erupted. We raced to the base of the next climb just trying to keep our legs turning over when Irina came by on the climb. Into the final switchbacks she dabbed, but I had to as well and gained no advantage. We chased each other into the final descent. Irina, Me, Willow. Through the feed-zone and to the finish with just 2 corners and a bridge to go and then Willow was passing me through a corner. One last chance around the next corner if she made a mistake, but she had the bit between her teeth and I would finish 2 seconds off the medals, 6 seconds from Silver and about 54seconds from Maja's winning time. Had we all not put up such an epic battle for the podium I wouldn't have felt nearly as pleased with my ride. But I was there. I battled hard and in the end i got beat. Medals are important yes, but more important is that I'm there. The other girls are just also damn fast. It was by far my best Worlds, not what I wanted, not what I was maybe capable of if i had played my cards slightly differently, but i'd rather put my energy into getting faster for next year than be-groaning what i could have done differently. I've lost some sleep over it already and now it's time to move on; and yes losing Worlds makes me hunger for it more next year. Canada put on a great Worlds and our athletes rose to the challenge. 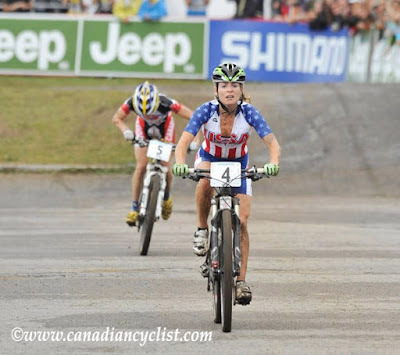 Lauren Rosser, the little ripper from squamish is now the JR World Champion with another year of Juniour left. Steve Smith took Canadian men's DH to a new level placing 2nd behind Sam Hill. Our juniour women's xc had their best finishes since the early 2000's and our juniour men showed we have some great talent coming up with a couple top 10 finishes. 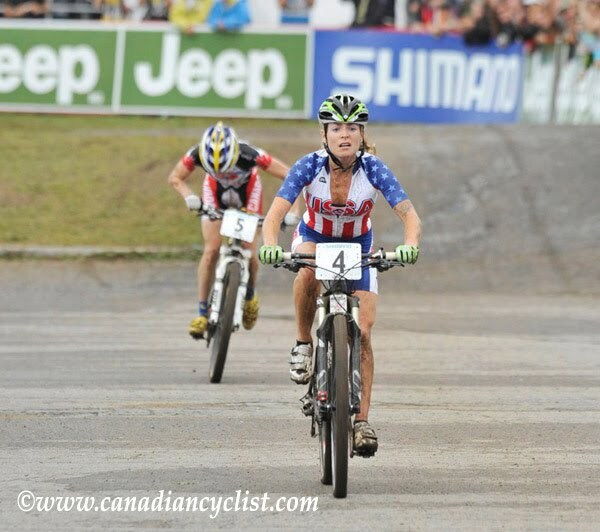 Emily Batty grabbed a 5th in the U23 race, Mikaela 14th. Team Canada rode well in the relay and Kabush rode a strong 8th in the men's xc. Housemate Matt Hadley had a great ride finishing 45 after losing at least 15 position reinflating a tire. In my race Marie-Helene rode to roaring fans to finish 9th while Amanda Sin held onto a top 30 after double flatting, finishing just off Mical Dyck. Catherine, Jean ann and Sandra rounded out the top 45. In all we were 68 riders with a great team of support staff. I can't mention everyone, just that they all rode extremely well with lots of heart. for so many reasons, you are a class act Catharine. The Elite Women’s Cross Country at Mont-Sainte-Anne is without a doubt the most exciting and greatest mountain bike race I have ever witnessed. Everything was left out on the trail by all the competitors and the women - all the women - who competed should be proud of this accomplishment. Women's sports all too often does not get the attention it deserves, which is unfortunate for both competitors and spectators alike. You, Catharine, were simply amazing. To race has hard as you did only a week after your victory in Windham is nothing short spectacular. There are only a few athletes in the world who could have done something like that. Hold your head up. I look forward to watching you race next season. Thanks so much for sharing this. You are an amazing athlete and person. I look forward to seeing you at the front next season as well.